The participation of both civil society and government is essential to the success of the Open Government Partnership. Their collaboration is vital at the international level and within each participating country. That is why OGP participants commit to developing their National Action Plans through a multistakeholder process, with the active engagement of citizens and civil society. 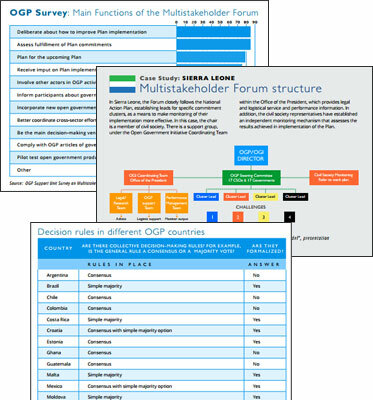 OGP’s consultation requirements ask countries to “identify an existing or new forum to enable regular multistakeholder consultation on OGP implementation.” The majority of OGP countries by now fulfill this requirement. This document shows the advantages of having a Multistakeholder Forum (or simply Forum) – a structured environment designed to maximize participation and cooperation between government and civil society by bringing relevant partners into the discussion and ensuring that all voices are heard. A Forum is a cornerstone of each country’s successful participation in OGP and is crucial to delivering collaborative open government reform. However, no two Forums are identical – the character of each nation’s government and civil society participants will influence the model they design and the practices they adopt for their open government work. 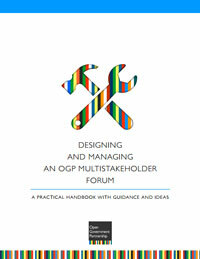 This handbook is intended to help government and civil society actors participating in national OGP processes to meet the Partnership’s guidelines. Moreover, it aims to support them in moving beyond the minimal requirements and develop fuller and more ambitious approaches to permanent government–civil society dialogue. It draws on the experiences of OGP participants to assist actors in refining existing mechanisms and to aid new actors to create and manage their own Forums. Each country’s stakeholders should consider their own situation and which aspects of different models would work best for them, as well as whether they would need to make use of other means in order to develop a successful permanent dialogue mechanism. The handbook can be accessed below, in various formats. An executive summary and database are also available. RTF and EPUB versions can be found here.